(2) The PDL application submitted by the PRL 3 joint venture in respect of the P’nyang field in December 2015 remains pending Ministerial grant. (3) Kina’s proposed transfer to Santos of a 20% interest remains subject to coventurer and regulatory approval. 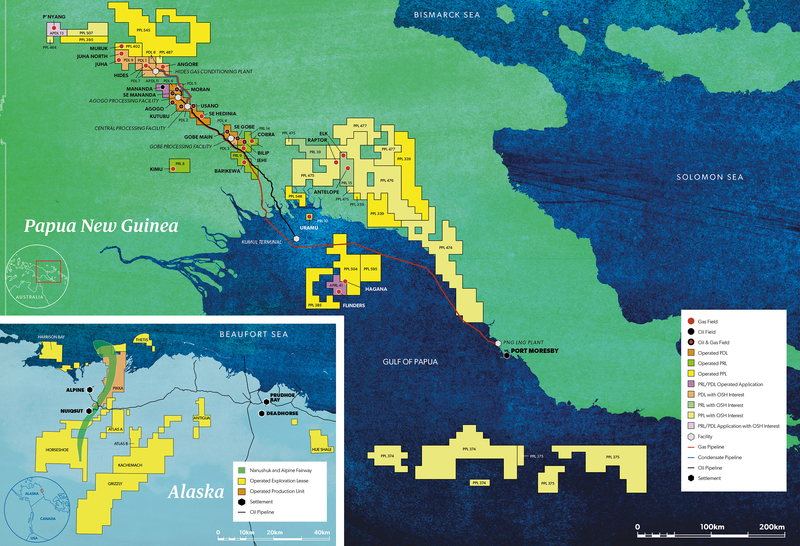 (4) In October 2017, Oil Search entered into an agreement with ExxonMobil and Santos under which Santos will potentially acquire a 20% interest in 20% interest in PPL 402 (being a 12.5% interest from Oil Search and a 7.5% interest from ExxonMobil). (5) In December 2016, Oil Search entered into an agreement with ExxonMobil and Santos under which Santos will potentially acquire a 20% interest in PPL 402 (being a 12.5% interest from Oil Search and a 7.5% interest from ExxonMobil). (6) Subject to due diligence, execution of binding agreements, conditions precedent and regulatory approvals. (7) Includes US Government and State of Alaska leases. Oil Search has an option to increase its interest by acquiring the balance of Armstrong’s interests in each asset.